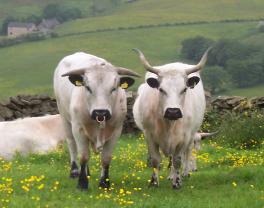 White Park Cattle. Note sexually dimorphic horns! Highland Cattle. A more modern breed! 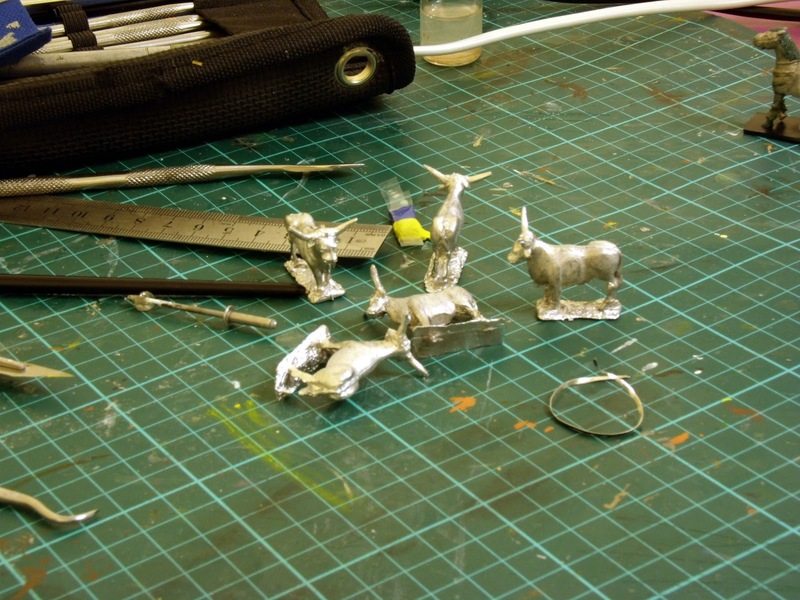 These miniatures cost a princely five pounds for the five from Irregular Miniatures, at this year's Vapnartak show. Their stand is always worth having a root around over. There's all sorts of weird and wonderful things to be had that are great for adding colour and interest to the table. 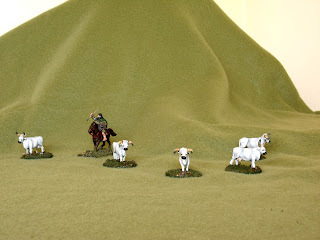 As you can see, the general shape and form of the bodies is close enough to White Park cattle to be convincing, and the horn shapes, while not exactly right are actually pretty close for the cows (upturned) and easily convertible for oxen or bulls (forward pointing). After a quick cleanup, tidy and fettle the models were ready for the minimal conversion needed. The flash, although it looks pretty bad, more or less fell off. With care, patience and a decent pair of pliers, I bent the horns on two of the animals to more closely match White Park cows. These two then got udders modelled with greenstuff. Well, with horns like that they aren't going to be maiden heifers, are they? Painting was simple: white undercoat / primer, followed by a coat of light grey into all hollows and dips. I drybrushed heavily with Vallejo deck tan (to blend the shading a bit) and then drybrushed with white. Finally I blocked in some highlights with more white. Ears (insides only! ), noses, eyes, hooves and odd bits of the lower legs were painted black and the horns a pale greyish brown, with panzer grey on the tips. 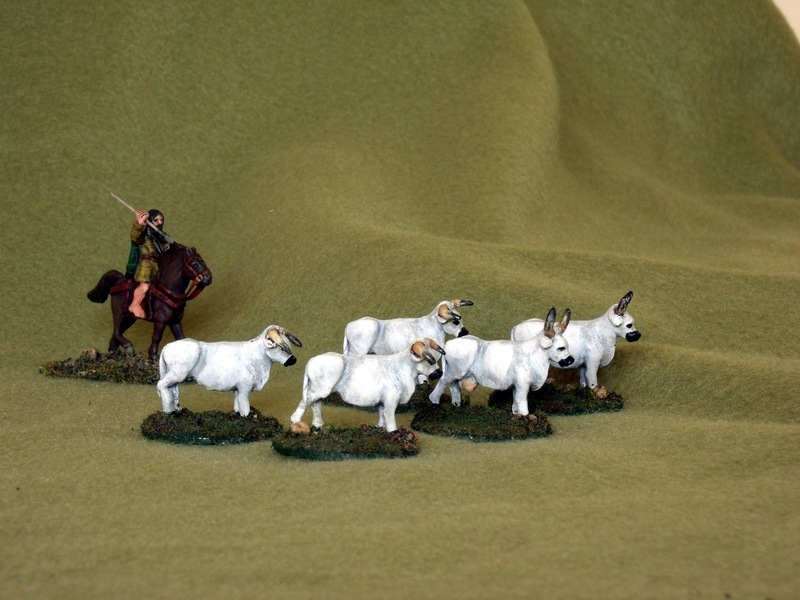 The udders on the cows were flesh tones, shaded and highlighted. Well, here they are - Dark Age burgers on the hoof. The Pictish horseman attempting to keep them going is from Newline Design for comparison. This side view gives a good idea of the build and form of the beasties. If plain black and white is a bit dull for you, there is another surviving strain, which has "red" (russet) ears. These would seem to be the subject of the Táin Bó Cúailnge, so how's that for a reference! 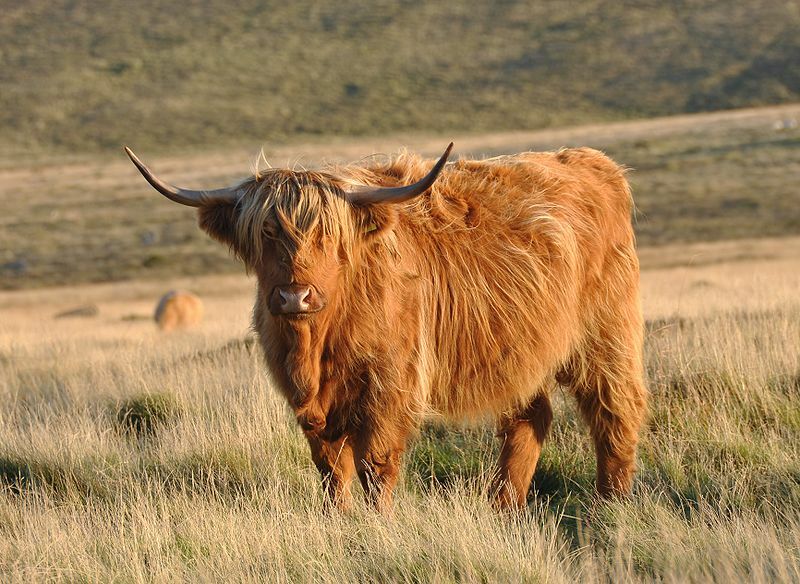 The "red" genes are recessive and now only seen in isolated herds, exemplified by the Chillingham Castle cattle. Pity the poor Pictish horseman trying to keep order among this lot!